Pastor Mic hael R. Alston, Sr. was born in Brooklyn, New York. He was raised in Henderson, North Carolina and is one of twelve born to the late Bishop Johnny and the late Mother Geneva Alston. He was educated in Vance County Public Schools. Pastor Alston has always had a heart for ministry. He shared the gospel with others and sang praises unto God. After answering the call, Michael became an ordained minister in 1989. While working with his father in ministry, he served as Minister of Music, President of the Men’s Department, and worked as a Sunday school teacher for many years. In 2007, Michael became an Elder in the Way of the Cross Churches of Christ International. In 2009, he was appointed as the Assistant Pastor of Greater Ransom Way of the Cross Temple. Additionally, Elder Alston was elevated to the office of District Elder in 2011 and became Interim Pastor of Greater Ransom in 2014. 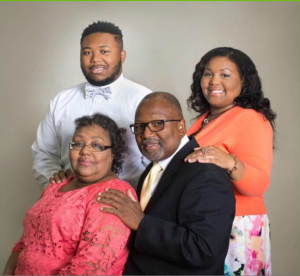 After the passing of his father in May 2016, Elder Alston became the Pastor of Greater Ransom WOTC on July 30, 2016. It is his vision to continue spreading the good news throughout the world so that souls may be saved and impact the body of Christ. Connie Alston, a native of Rocky Mount, North Carolina came to Henderson, NC while furthering her education at Kittrell Job Corps. While attending KJCC she met Michael. The two fell in love and have been married over 30 years. To their union two children were born Sherri and Michael Jr., both are also active in ministry with their parents. Lady Alston is an amazing woman of God and follows the guidance of the Holy Ghost. She is a prayer warrior and has a genuine heart for the people of God. Lady Alston has taken care of the sick and those in the rest homes, assisted single-parents, fed the hungry as well as guided women according to the word of the Lord. Lady Alston stands beside her husband and supports him in many of his duties. In addition, she teaches the women biblical principles as it relates to being holy women- single or married, nurturing parents, giving Godly council to women, promoting sister fellowship and stabilizing souls. Lady Alston is an awesome cook and enjoys feeding the people naturally. She also shares in the quest for souls with her husband and she is a great asset to this ministry.